Emergency Notification System - Register Now! The City of Worthington is now partnering with Franklin County Emergency Management and Homeland Security to bring a new emergency notification and warning system to its residents. ALERT Franklin County is customizable and allows you to choose what kind of community notifications you want to receive, how you would like to receive them and the location you want to receive them for. You can elect to receive emergency notifications about severe weather and disasters, as well as Worthington specific information regarding crime alerts, road closures, transportation incidents, utility outages, government closings and other important community news. The City of Worthington previously contracted with CodeRed for emergency notifications. If you signed up to receive notifications through CodeRed, your contact information will transfer over to the new ALERT Franklin County system. 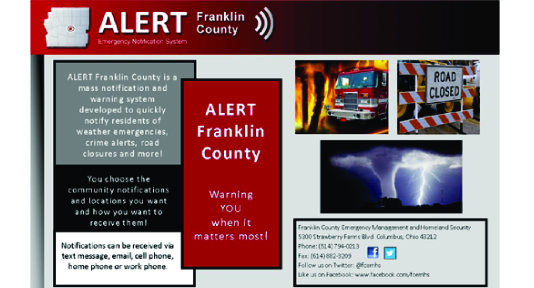 To register for ALERT Franklin County notifications, visit AlertFranklinCounty.com and click on the registration link. You will then be prompted to select which categories you’d like to receive information about, including Worthington specific information. You can receive the alerts via email, phone call, or text message.